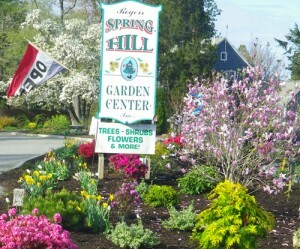 Rogers Spring Hill Garden Center is the result of four generations of farming in Ward Hill in Haverhill MA. In 1902, Randolf Rogers purchased a modest 2.5 acres of land, a horse and a cow and began farming vegetables. In 1941, Randolf’s son Harold expanded the farm with more cows and he expanded the business into milk distribution. In 1978, spring water was discovered on the farm and the family business expanded again — now into the booming spring water business. Rogers Spring Hill Water is distributed through out New England even today. The 1980’s was the right time for Harold’s son Richard to begin the farm’s “Pick Your Own” operations. Strawberries were the first crop in 1985. Rogers’ ‘Pick Your Own” strawberries, apples and pumpkins are still a popular Haverhill tradition. In 1990, Richard’s children, Stephen and Barbara purchased the garden center further expanding the business. Today, the combination of the farm and the garden center gives customers ‘home grown’ annuals, perennials, as well as summer sensational vegetables. The garden center has grown to be the largest nursery in the Merrimack Valley, offering a vast selection of annuals, perennials, nursery, tools and landscaping products. We also offer high quality landscape design services, with trained and experienced landscape designers on staff.